Ajwain leaves are known as Karpooravalli ilai. Also called as omavalli ilai in Tamil and doddapatre (sambar balli) in Kannada. The leaves are used as home remedy for cough, nasal congestion,cold and indigestion problems. And now to the aromatic, simple and tasty recipe. Corn flour - 2 tsp. Pluck leaves with stems intact, wash well, pat it dry and keep ready. Mix all ingredients well (except the leaves). Add water little by little to form a medium thick batter. 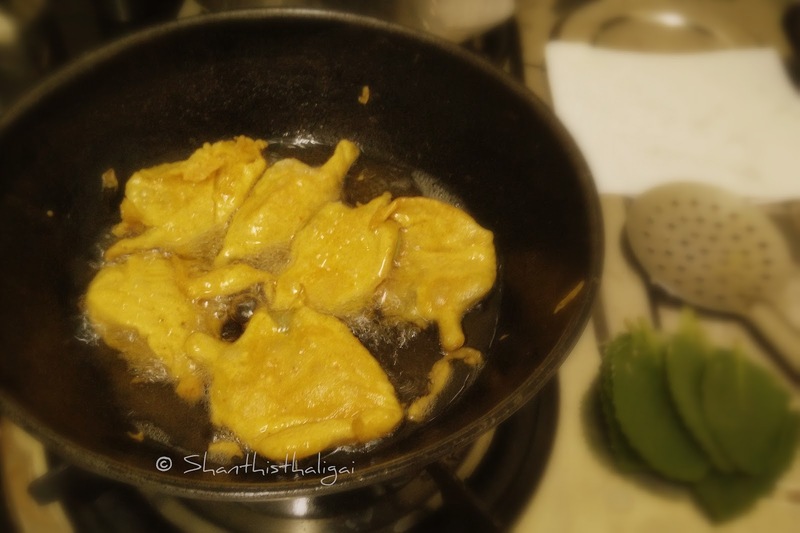 Heat oil in a kadai , dip the leaf one by one in the batter and gently drop in the oil. Fry in medium flame until golden brown. Serve hot with any chutney of your choice.